The sun was shining at Jesse Owens Memorial Stadium Friday afternoon and so was junior attack Sara Dickinson, who led the Ohio State women’s lacrosse team to a 12-10 victory against Rutgers. Dickinson finished the game with three goals and three assists to help the Buckeyes (3-5, 1-1 Big Ten) claim their first conference win of the season against the Scarlet Knights (4-6, 0-2 Big Ten). 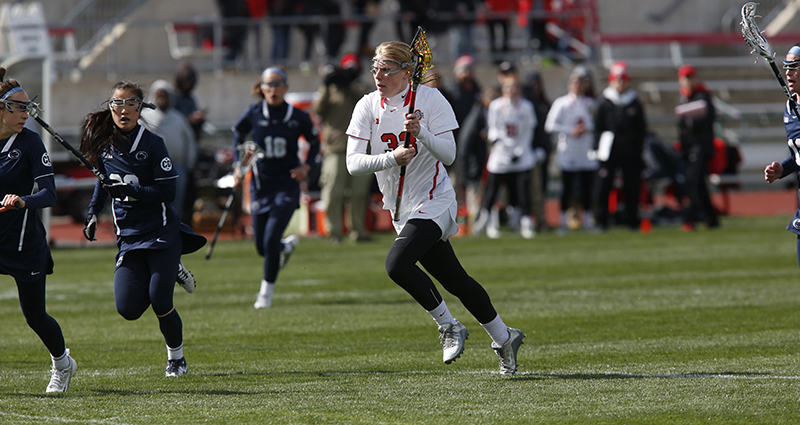 Two early turnovers gave the Scarlet Knights an opportunity to put the first point on the board with a free-position goal by junior attack Dana Gisonno. The Buckeyes responded with a 3-0 run to take a 3-1 lead. Ohio State kept the momentum going with two goals by Dickinson and points from junior attack McKayla Conti and freshman midfielder Lindsay Epstein. Rutgers closed out the half with a late goal by junior midfielder Allie Ferrara that brought the score to a 7-4 halftime lead for Ohio State. The Scarlet Knights began chipping away at Ohio State’s lead in the second half. Goals from senior midfielder Paige Paratore and freshman midfielder Taralyn Naslonski tied the game at eight with 20 minutes left to play. Both teams were held to a 10-minute scoring drought until Buckeyes junior midfielder Baley Parrott gave her team the lead with an assist by Dickinson. Parrott tied Dickinson with three goals and finished the game with four draw controls. Senior attack Molly Wood had four draw controls as well as two goals. The final score of the game came when Rutgers senior attack Kerri Puckhaber closed Ohio State’s lead to two with 1:28 left to play, but there was not enough time left for a Scarlet Knight comeback. The Buckeyes picked up 26 ground balls compared to Rutgers’ 18. Ohio State held a two-shot advantage over the Scarlet Knights. The Buckeyes will face Robert Morris at 4 p.m. Wednesday.